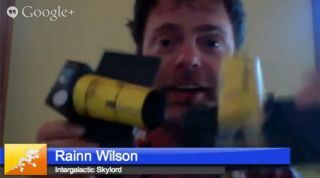 Rainn Wilson holds ARKYD Telescope model while speaking online with Peter Diamandis of Planetary Resources, June 25, 2013. Actor Rainn Wilson is a little bit worried about what the private asteroid-mining company Planetary Resources might do once it reaches space. Wilson (Dwight Schrute on TV's "The Office") jokingly compared Planetary Resources to the evil empire in "Star Wars" and the space mining company that destroys Pandora in "Avatar" during a nearly hour-long Google+ Hangout with the company's co-founder Peter Diamandis on Tuesday (June 25). "There's a lot of wealth and resources for humanity out there and the fact that we're a crumb in a supermarket filled with resources just [means that] we've got to stop digging for stuff on the Earth and start looking out there for it all that's available and easy to be grabbed," Diamandis replied. Diamandis hopes to send spacecraft to near-Earth asteroids in order to mine them and bring the resources back to the planet. Planetary Resources has raised more than $1.1 million for its Arkyd 100 space telescope using the crowdfunding website Kickstarter. The telescope will seek out asteroids and take "space-selfies" — photos submitted by users that will beam up to space. Upon launch, Arkyd 100 will be the first public space telescope in history, company officials have said. "I'm all for the advancement of humankind and going into outer space and finding new frontiers and working together and doing it," Wilson said during a sincere moment of the broadcast. "I think this is the future and I think you're at the forefront so it's pretty exciting." If the company hits its $2 million stretch goal by the time the campaign ends on June 30 at 10 p.m. EDT (0200 July 1 GMT), they will equip the Arkyd 100 with alien planet-hunting capabilities that will allow it to search for exoplanets around distant stars. The Arkyd 100, expected to launch in 2015, is only the first of many Arkyd telescopes that Planetary Resources is hoping to send into orbit. The Arkyd 200 and 300 will have the ability to scope out asteroids and propel toward them once spotted, Diamandis said. "They'll be constantly waiting for the right asteroid that's coming by and when it sees it coming by, it'll ignite its engines and go on a pursuit mission, eventually matching orbit with that asteroid and effectively rendezvousing or docking with it," Diamandis said. You can learn more about Planetary Resources' Arkyd space telescope and public project using the company's Kickstarter campaign.